Seven decades after its owner William Randolph Hearst left his California castle for the last time in 1947, it continues to fascinate visitors continues to fascinate visitors. Today it's a state park and the only way to see the house and grounds is on a guided tour. All Hearst Castle tours spend about an hour at the house, but that turns into a little more than two hours when you include the bus trip up and down the hill. All tours include the Greco-Roman style Neptune Pool outdoors and the Roman Pool, an indoor beauty lined with cobalt blue Venetian glass and shimmering gold tiles. On any tour, the guides share stories about life at Hearst Castle. They talk about sending for dishes from the San Francisco house when British Prime Minister Winston Churchill visited Hearst Castle, explain why there are still price stickers on the catsup and mustard on the dining table, and mention the celebrities who visited. If you want to take more than one tour, you can stay on the hilltop between daytime tours (or stay after any tour) to enjoy the gardens and visit the Neptune and Roman Pools. The Grand Rooms Tour: An introductory tour of five ground floor rooms in the main house, the 18-room Casa del Sol guest house, the Esplanade and gardens - and admission to the Building the Dream film. The route includes 159 steps, both up and down, and a 2/3-mile walk. Upstairs Suites Tour: Focusing on architecture and art in the main house, this tour takes you upstairs. You'll see the Italian-style Doge's Suite, Duplex Bedrooms, the Celestial Suite, the gardens and the library. The route includes 332 stairs (up and down) and a 3/4-mile walk. Cottages and Kitchen Tour: Given April through October, this outdoor tour focuses on the gardens and includes the wine cellar, Casa del Mar (where Hearst lived his final years), Casa del Monte, a hidden terrace and the kitchen. The route includes 204 stairs, up and down, and a 3/4-mile walk. Designing the Dream: Get an overview of how the Castle was built from its earliest construction in the 1920s, through the final touches done in the mid-1940s. See the Casa del Sol guest house and the north wing of the big house, its newest section. Art of San Simeon: A two-hour semi-private tour that focuses on Hearst and how he acquired his paintings, tapestries and other works of art. Evening Tour: Combines elements of tours one and two, plus the 18-room Casa del Sol guest house and a 1930s newsreel. It's given spring and fall, most Friday and Saturday evenings. This is my favorite and most highly-recommended tour because the costumed docents bring the place to life. From mid-November until just after New Year's Day, it's called a Holiday Twilight Tour, and you can see the castle decked out for Christmas. Find out more about the Hearst Castle evening tour. Accessibly Designed Tours: It's sometimes difficult to tour an older structure like Hearst Castle, but Hearst Castle offers modified tours that accommodate all kinds of accessibility issues. They offer an accessible version of the Grand Rooms Tour and the Evening Tour. Brochures are available in most common languages and in Braille. You can visit Hearst Castle in a wheelchair, but you need to call at least ten days in advance to reserve one. You can buy tickets for Hearst Castle tours at the castle visitor center or reserve online at Reserve California. If you want to take more than one tour, allow 1 hour 20 minutes between their start times. 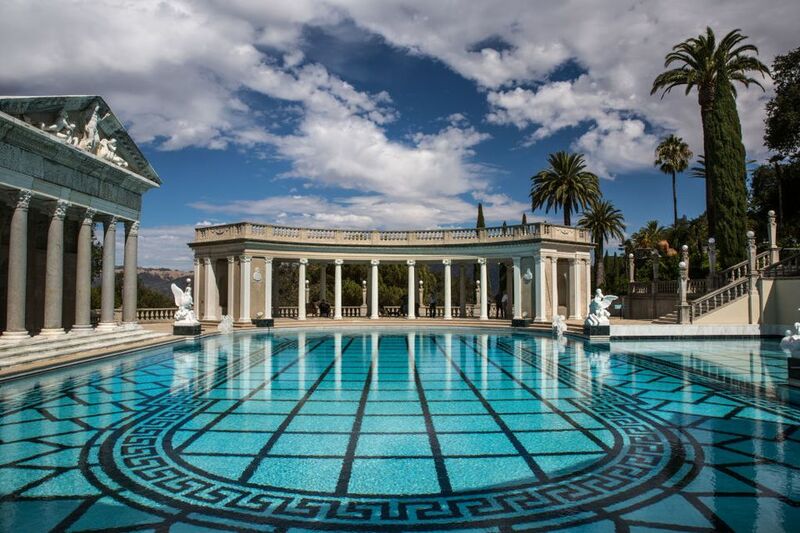 On a busy day, you could easily arrive at Hearst Castle in mid-afternoon, only to find the next available tour is not until the following afternoon. Save frustrations and reserve your tours in advance. To avoid long waits or even sellouts, reservations are essential for the Grand Rooms Tour, especially during summer and long holiday weekends.